The idea of purchasing premises on the then new Whiterock Estate in Graigwen was first conceived by the Rev. John Harris Hughes in 1968. 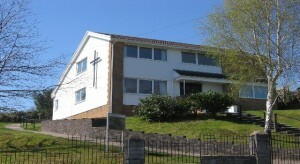 Church Elders and members of St. David’s Presbyterian Church, Pontypridd, supported this idea. Having received permission, and the promise of a grant from the Presbytery, the residents of Whiterock and the Mayfield development were approached in order to gauge the strength of feeling for or against the project. Reaction, for the most part, was favourable and the wheels were set in motion to find a suitable site, seek estimates and complete other activities associated with property purchase. The present site was finally decided upon in 1970, as it was seen to be central to all the housing developments in the area. The plans were drawn up by Mr G Richards, of Messrs LFG Thomas of Bridgend, and Jones Brothers were contracted to build the house at a fixed price of £10,307 (£350 of which was for heating). Oil-fired heating was decided upon, as it was the cheapest form of heating available at the time. However, the heating has since been changed to gas-fired. Most of the money was raised thanks to the good offices of the Connexion Finance Board, which gave a grant, the Pantyfedwen Trust, which did likewise and a personal gift from Mr A Greatrex. The rest of the money was raised from other charitable organisations. Building began in 1971 and the keys were handed over to St. David’s Church in Sept. 1972. Many meetings took place between the committee members of St. David’s and people from the estate in the months of January to May of 1973. Many things had to be considered ranging from what activities could be held and what furniture was needed – to which system of central heating would be the most economical and the urgent need to purchase a dustbin! A ladies’ guild, a nursery group, a playgroup, Guide, Brownie and Cub packs, a conversational Welsh learner class and an Adventure Club. The first Sunday Service had already been held on January 28th, 1973 and a Sunday School had been formed. On Saturday evening May 5th, four present and past Moderators made their way up the steep Graigwen hill to officiate at the opening ceremony. The Rev. R B Owen, Moderator of the General Assembly, Rev. G P Jones, Moderator of the Association in the East, the Rev. Elfed Evans, Moderator of the East Glamorgan Presbytery, our own minister Rev. J Harris Hughes (a past Moderator of the Association in the East), together conducted a memorable service of dedication. The visitors included ministers and clergy of the area and councillors and prominent leaders in educational and social work. Among the congregation were many who had been generous indeed in their support of Church House and all were warmly welcomed and entertained by a band of workers from the surrounding houses. The service began with the singing of a hymn during which the Rev. Harris Hughes, who was accompanying, accidentally broke one of the pedals of the harmonium but continued without any detrimental effect to the accompaniment. The Moderator of the Association then led the gathering in prayers of dedication and discipleship. He rejoiced that in these modern days, the Church was facing the challenge of the future. The Church House of Graigwen was an experiment whose future would be closely watched by many. What has happened at Church House between the years 1973-1998? – Quite a lot. By 1983, even though the Sunday evening service had foundered, membership of Sunday School had rocketed to 100 – incredibly in the ratio of about 70 boys to 30 girls! The building wasn’t built to cope with that number and so the idea of an extension was born. The Rev. David Smith oversaw this project as the Rev. J Harris Hughes had retired (well … semi-retired). Miss Lynda Bull, who had succeeded Mr Fred Webb as Secretary of Church House, worked extremely hard to raise the necessary capital. Grants were given by the Presbyterian Church of Wales, the Welsh Church Acts Fund, the Pantyfedwen Trust and the Jane Hodge Foundation. The rest of the money was raised from fund-raising events, notably the proceeds from a concert given by the Pendyrus Male Voice Choir. In October 1988 the extension (built by Community Industries) was opened after a short service of dedication. Holiday Clubs were held in 1987 by Richie Osborne and in 1988 by Geoffrey Barrington. These were very well attended. In 1989 an extremely successful fund-raising concert was given by three primary schools whose pupils attended Sunday School. 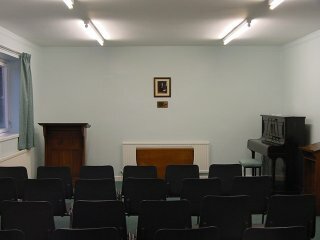 In the same year, Mrs Rose gave a gift of an outside notice board, in memory of her husband Haydn. Miss Lynda Bull, with the backing of Church House Committee, applied successfully for a grant from the Prince of Wales Trust to refurbish the front of the building and to landscape the grounds. Thus it was that the porch was rebuilt and trees and shrubs planted. In 1983 Church House had celebrated its tenth anniversary, and in 1993 it looked forward to celebrating its twentieth anniversary. The children were given commemorative leather bookmarks on both of these occasions. The adults celebrated the installation of a brand new kitchen – the result of Lynda’s hard work applying for – yes, you’ve guessed it – more grants. 1996 saw the erection of new gates and railings around the boundaries of Church House. This step was not taken lightly, but everyone, without exception, has said how these railings have enhanced the appearance of Church House. And so we arrive at 1998. The last twenty five years have seen the building of an extension, the landscaping of grounds, a completely new gas central heating system and kitchen installed, the erection of new gates and railings, and at night time the building is enhanced by external lighting. And what of the activities in the building? – Have they foundered or survived? Here is a list of all the groups still using Church House:- English and Welsh playgroups, English and Welsh mother and baby groups, Monday evening Ladies guild, Thursday evening Ladies guild, Brownies, Adult Leisure Group, Neighbourhood Watch which holds a monthly meeting, children’s parties and it is also used as a polling booth both for local and General Elections – thus fulfilling a vital community service. There are about thirty children who come to Sunday School regularly and most of them attend a weekly ‘7-UP’ Club. Some families, together with members of the community, attend a family Service on one Sunday a month, that is led by our present minister the Rev. Alvan Richards-Clarke. A truly good community bond exists between children, parents and teachers and there is unstinting support from the adults for any activity engaged in by the children -such as concerts or sponsored walks. Church House is still here, but facing new challenges, ranging from expanding nursery education in the area which has affected numbers in the playgroups, to the loss of Sunday School children to mini-rugby and soccer clubs. However, with the continued support of dedicated helpers, workers and parents, Church House will hopefully continue to play a part in the social and spiritual life of the community well into the next Millennium.